Click to download and print this program. 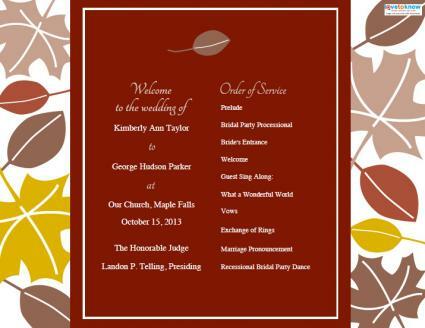 Programs for a fall wedding celebrate the beauty of the autumn season. 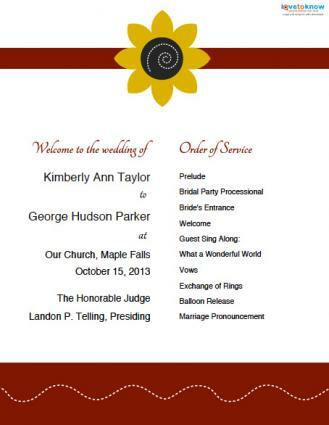 You can take advantage of free printable wedding programs designed just for a fall nuptial celebration. f you need help downloading these printable programs, check out these helpful tips. This lovely program features a sunflower in the center of burgundy ribbon. It won't take up a lot of computer ink and the white space makes it easy to read. The faded leaves in the background of this invitation are a lovely touch for an outdoor wedding. If none of the options above suit your wedding style, you can find plenty of additional programs at wedding supply stores, craft stores, or online. 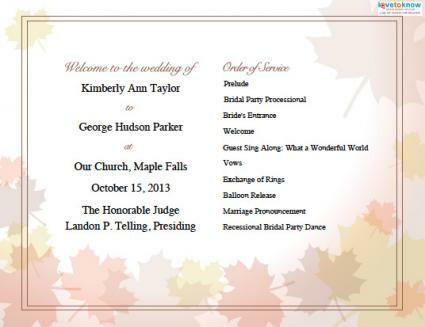 Fall Branch from Wedding Paper Divas: A single fold program with a basic branch and orange leaves is a good choice for couples who are having a minimalist wedding. Program orders start with a minimum of ten for less than $45, and the price per program goes down as more are ordered. Harvest Glow from Wedding Paper Masters: Choose from three size options for this colorful orange and gold leaf fall program. A photo can be added to the front for no additional fee. Pricing varies depending on the number ordered; get 100 for around $167. Fall Wedding Programs from Terry's Village: Add a touch of romance to your fall invitation by choosing this design from Terry's Village. It features leaves and scrollwork in the shape of a heart on the front. You can get 50 sheets for under $10, making it an affordable choice for brides on a budget. You'll need to format and print the programs using your own printer. Personalized Autumn Leaves Printable Program Paper from Beau-coup: Buy these papers with leaf outlines and print your own programs at home. The minimum order is 24 sets of two for just over $40. You can personalize the front with two lines. Show off autumn's abundance and let your guests enjoy your fall theme by choosing a wedding program featuring fall accents and colors. Regardless of what program design you choose, remember to proofread before printing or purchasing to be sure your information is correct.